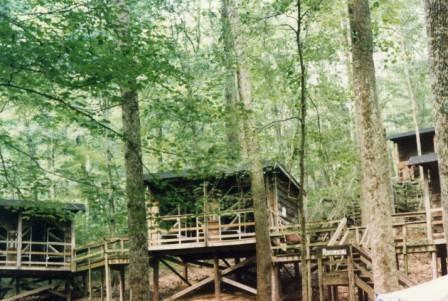 Camp Ondessonk’s Spots to Stay- Live in a Treehouse! 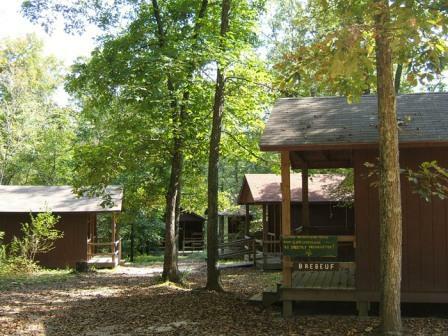 The cabins at Camp Ondessonk provide a unique camping experience. Each of our rustic, non-electric units accommodates 30-40 campers in 5-6 cabins. Shower houses are located nearby. Staff members supervise the unit from their own adjacent cabin. A unit is like a family for the entire week. Units attend activities together, compete in camp games, and build a sense of community. The BOQ sits in a prime location, just behind the dining hall and close to everything in the main area. It’s one of very few camper residences with electricity, paned windows and doors. Staff sleep in a separate room inside the building. Just down the hill from Lalemant, Lakeside is the largest cabin in camp and the only cabin with four closed sides and screens. The west-facing doorway is open for a great view of Lake Echon. 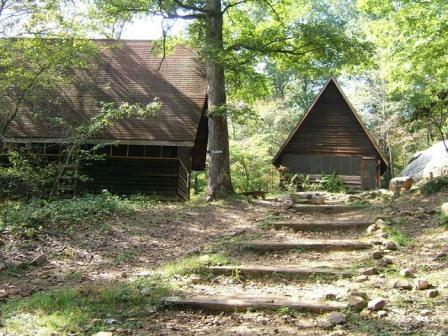 Up to four staff sleep in a smaller cabin nearby, next to the site of the old Garner Bridge landing. One of the four original units, Daniel overlooks the main fork of Lake Echon. Its prime location near the swimming and boating areas and new bathhouse make it a popular unit. 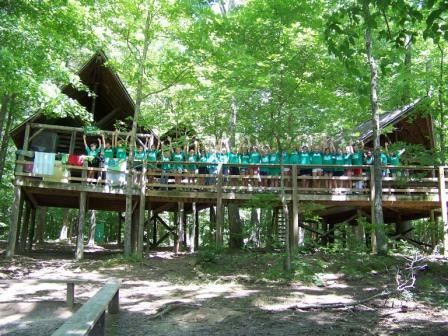 Each treehouse holds 8 for a total of 40 campers and 6 staff. Garnier sits right next to the Lake Echon spillway, a wide, rushing waterfall. It’s most easily accessible via the Amantacha Swinging Bridge. Forty campers and 6 staff power The Green Machine, always one of the most spirited units. 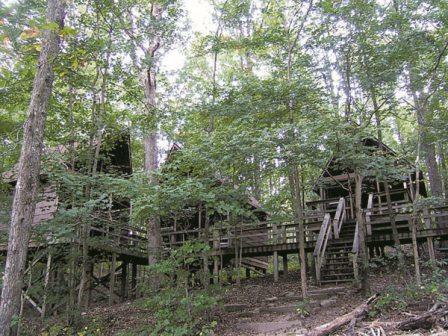 Rebuilt in 2000, these buildings resemble a treehouse but sit on the ground. 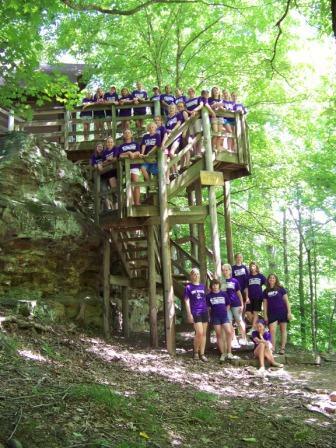 Located on the Lake Echon peninsula and close to the historic swinging bridge, the unit of Brebeuf holds 40 campers and 6 staff. Eight campers share each cabin. Perched atop a hill, Lalemant’s 40 bunks overlook a smaller channel of Lake Echon. Years ago the Garner Bridge used to connect it to the main area; now its accessible via either the Goupil Footbridge or the Amantacha Swinging Bridge. Recommended for younger campers, the unit of Tekakwitha features 3 large A-frame lodges housing 12 campers each. Each lodge is equipped with screens and a door, as well as plenty of floor space. An average of two staff sleep in a separate room in each lodge. This one-of-a-kind unit houses 32 campers and 6 staff under a gigantic sandstone ampitheatre. 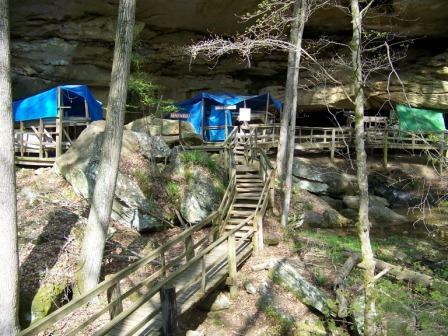 Groups of 6-10 bunks are sectioned off into “cabins” and connected with a winding catwalk. One of camp’s waterfalls trickles into a small pond and stream below. 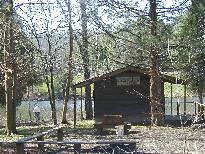 Set “way back in the woods” in a peaceful clearing, Raganeau’s 32 bunks are arranged into 4-bunk rooms. 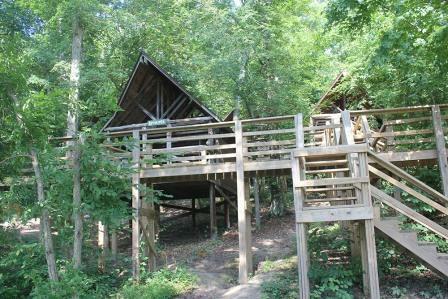 One newer treehouse building, which holds 8 campers, sits on the ground. The “Stairmaster Unit” of Goupil sits atop a 40-ft sandstone cliff, accessible via a unique winding staircase of 75 steps. Forty campers and six staff live in Goupil, one of the four closest units to the main area of camp. 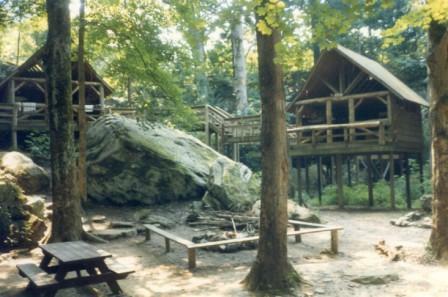 Rebuilt in 1998, these 3-sided, A-frame buildings allow the cool night air to breeze through, as do all our treehouses. Amantacha is one of two units who get to cross the swinging bridge daily over Lake Echon. It’s also one of the smallest units, holding 32 campers (8 to a treehouse) and 6 staff. Lalande neighbors the “Beach house” bathhouse and staff bathhouse “A,” making it the closest unit to the main area of camp. Forty campers and six staff live in Lalande, which is right across a footbridge from Goupil.